India registered a strong comeback victory in the second one-day international as they thrashed Sri Lanka by 141 runs to tie the three-match series at 1-1. 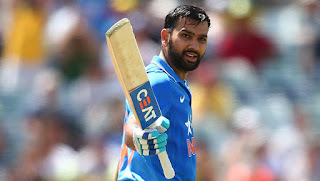 Stand-in Indian captain Rohit Sharma made a huge statement as he slammed his third ODI double-century, second against Sri Lanka, to guide his team to an easy win. Chasing a mammoth total of 393 runs to win the series, the Lankans were never in the chase and wilted under the proverbial 'scoreboard pressure'. Angelo Mathews played the lone hand of 111* as Sri Lanka managed to get 251 runs from their 50 overs. Yuzvendra Chahal was the pick of the bowlers for India as he picked up three wickets. Debutant off-spinner Washington Sundar picked up his maiden wicket when he clean bowled Lahiru Thirimanne. Earlier, Sri Lanka's decision to win the toss and field first backfired as the Indian opening duo of Shikhar Dhawan (67) and Rohit Sharma put up a century opening stand to lay the foundation of a big score. The Sri Lankan pacers bowled well in the initial overs as both Dhawan and Rohit opted for a cautious outlook during the first powerplay. Dhawan though broke the shackles soon and started targetting the Sri Lankan pacers. It was in the 14th over that Shikhar Dhawan showed his full range of shots as he scored three boundaries off the bowling of Nuwan Pradeep and went on to bring up his 23rd ODI half-century in the next over. Rohit Sharma, who had till then played the waiting game, got going once the spinners came on to bowl. Dhawan's desire to get quick runs under his belt backfired as he mishit a flighted delivery from Sachith Pathirana to the short mid-wicket fielder to get out for 68. Dhawan's fall brought the young Shreyas Iyer into the middle and he looked busy from the word go. Both Iyer and captain Rohit mixed caution with aggression to keep the scoreboard ticking in the middle overs. The duo punished the wayward Sri Lankan bowling to take India past the 200-run mark in the 35th over. It was the young Iyer who reached a milestrone first as he brought up his maiden ODI half-century in his second ODI appearance. Rohit followed suit and scored his 16th ODI century, the ton was his 14th as an opener, which tied him with Virender Sehwag for the third position in the list of most centuries scored by Indian openers in one-day internationals. The real carnage started thereafter as both Shreyas Iyer and Rohit Sharma started taking risks and playing the big shots. It was the young Iyer who looked more menacing as he danced down the track to heave the spinners over the fence. But soon Rohit Sharma got into the act and started innovating and the result was pure joy for the partisan crowd at the PCA stadium in Mohali. He cut, pulled, swept and drove with elan as runs kept flowing from his broad blade. The Indian captain hit four massive sixes off the bowling of Suranga Lakmal and then hit another two sixes off the next over by Numwan Pradeep to bring up his fifth score of 150-plus in one-dayers. Shreyas Iyer tried to emulate his captain and reach the three-figure mark but was caught in the deep after playing a great hand of 88 runs. Everything else from then on didn't matter as it was a one-man show, Rohit Sharma brought up his double century in the final over of the innings. He remained unbeaten on 208 as India piled up a huge 392/4.